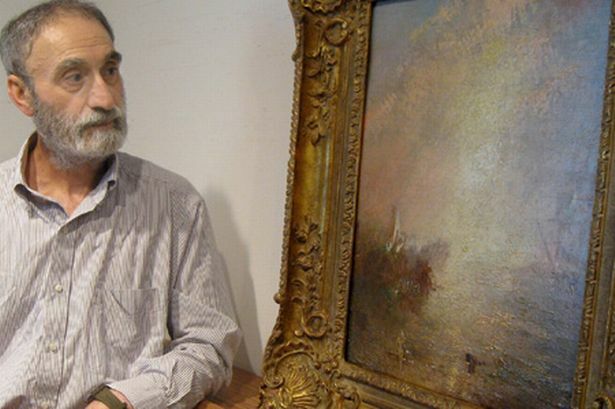 An obscure oil painting bought for thousands in a private sale is a priceless lost Turner masterpiece, according to a leading Birmingham expert. The small seascape, which was purchased in Wales five years ago by Frank Faryab, an art and antiques dealer, could be worth several million pounds. Mr Faryab, who lives in Cirencester, Gloucestershire, was tipped off in 2007 that the work might be by Turner, although it was sold as a minor work by another artist “in the manner of Turner”. Mr Faryab claims to have spent more than £2 million and much of the past five years trying to persuade experts that the painting, a 20in x 16in oil-on-pine panel of a hazy sailing ship, is in fact by JMW Turner. He will not say how much he paid for it. He has had it cleaned and reframed and has gathered scientific evidence, including infra-red dating, checking fingerprints and artistic tests to prove its provenance. “Years of neglect, dirt, soot and nicotine had left their mark. But I instinctively knew its true quality, which was why I was prepared to invest so much on research proving my judgement,” said Mr Faryab. The work, painted in October 1844, depicts the boat of the French king, Louis-Philippe, arriving in Portsmouth harbour. This event is well recorded in the papers of the day and in five other Turner pictures owned by the Tate. Turner and the king were friends. In fact Louis-Philippe, who reigned from 1830 to 1848, lived near Turner from 1800 to 1815 in Twickenham, London, and even gave the artist a snuff box. Three Turner authorities have been to Geneva, where the painting is kept, and all have reported either categorically or “almost certainly” that the work is by Turner. Doctor James Hamilton, of the University of Birmingham, described the work as a “magnificent Turner”. On the subject matter of “The arrival of Louis-Philippe at Portsmouth in October 1844” he added: “Important as the event was for Anglo-French relations it was also an important personal moment for Turner himself. “This was the arrival of an old friend who was now a crowned king. “We can draw the certainty that paintings were slipped out of Turner’s studio, in the last years of his life, or perhaps soon after his death. “Much advantage was taken of the elderly artist, with or without his knowledge. James Miller, former deputy chairman of Sotheby’s, wrote to Faryab that it was “an authentic work by Turner”, while the London art dealer Lowell Libson told Faryab that it was “almost certainly” by the artist. Turner was a prolific artist who did several works each day. Most were drawings, etchings and watercolours, but there are known to be about 550 oils, some large works, some smaller, such as this study, which is in effect a try-out for a bigger oil on canvas. Mr Faryab bought the painting as Ships at Sea. It is now retitled The Arrival of King Louis-Philippe. Mr Faryab was helped in 2003 when the Tate identified two of its Turners, originally thought to be of Venice, as the French king’s arrival on the south coast. The newly discovered work looks similar to a scene from those paintings, and to another Turner at the Tate called Hurrah! For the Whaler Erebus! Another Fish!. Hamilton believes that the picture was kept in the artist’s studio until his death in 1851, and then sold by John Pound, the son by a former marriage of the artist’s last mistress, Sophia Caroline Booth. Mr Faryab has been talking to Sotheby’s about a possible sale. Experts in the auction house will be examining the painting in detail in the next few weeks. Newly uncovered oils by Turner are rare. The last significant one, Landscape with a Rainbow, was identified in 1995. The top price for a Turner is £29.7 million for Modern Rome — Campo Vaccino, which was sold in 2010.